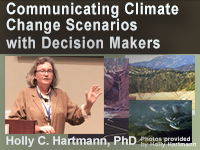 In this 1-hour lecture, presented in three parts, research hydrologist Dr. Holly Hartmann discusses issues and approaches for communicating with decision-makers regarding climate change topics in water management and planning. Dr. Hartmann is a national leader in research related to the development of decision support tools for climate, water, and other resource management applications, especially linking research with the needs of decision-makers and moving research into agency operations. Dr. Hartmann is Carpe Diem West’s Director of Climate Science Applications. Previously she was Director of the Arid Lands Information Center at the University of Arizona (UA). She is a co-investigator within the Climate Assessment for the Southwest (CLIMAS) and leads the scenario development team within the UA Science and Technology Center for the Sustainability of Semi-Arid Hydrology and Riparian Areas (SAHRA). This presentation was given as part of the Integrating Climate Change into Longer-term Water Resources Planning and Environmental Compliance class, offered 2-4 May 2016, in collaboration between The COMET Program, the U.S. Bureau of Reclamation, and the U.S. Army Corps of Engineers. Explain the concept of actionable messages in climate reports. Describe how to help decision-makers correctly interpret the most relevant messages from models and reports. Describe best practices for report writing: link past, present and future. Explain the importance of matching one’s climate message to the audience; recognize distinct groups that react to information differently. Explain the importance of the choice of language in communicating with specific audiences; avoid jargon, speak in common terms. Explain the meaning and significance of the concept of “stationarity” and the impact of “non-stationarity” in hydrologic climate forecasting. Recognize the key features of an iterative risk management framework and why it is recommended by the National Academy of Sciences. Describe the use of scenarios and scenario thinking to characterize and embrace uncertainty in climate forecasting. Recognize that climate projections are not the same as forecasts or predictions. Describe examples of available scenario planning guides from governmental agencies. Recognize key features of an adaptation planning framework, and how it is used to work with decision-makers. Explain the importance of national and regional climate assessment studies and their relationship to local studies. Describe the importance of understanding how the genealogy of research studies leads to our current understanding of climate. Describe available tools and resources for climate communications.